Although a quiet month for showjumping at Avonbrook Stud, young rider Katherine Bertram has been keeping herself entertained in the show ring this August. With Avonbrook Odin (Marcus Aurelius x April) still recovering from his stable injury in early July, any thought of showjumping this month was quickly squashed. While I allowed my British Showjumping card to remain untouched, I was not left completely stranded in terms of competitions. 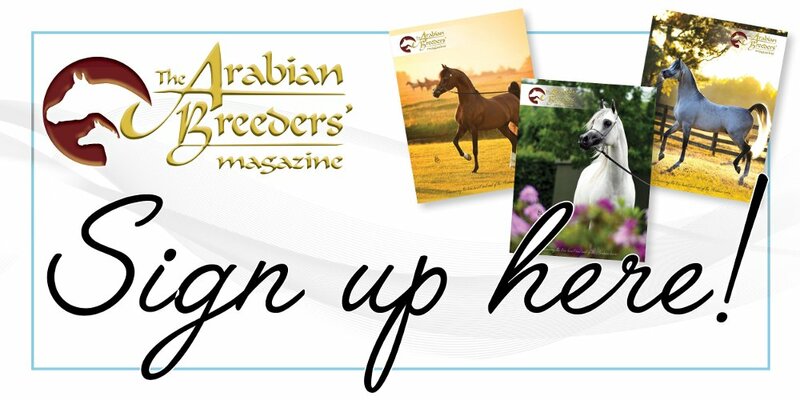 August is a month that sees many showing championships take place, as well as the all-important final Horse of the Year Show (HOSY) qualifiers of the season in the ridden purebred Arab section. 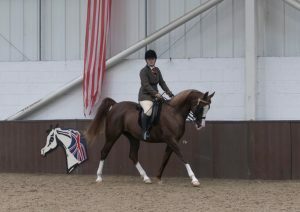 Therefore, it was Annia Aurelia (Marcus Aurelius x Bint Zaehaebi) – Penny – who took centre stage once more as I had a crack at my final two HOYS qualifiers in our first open season together. 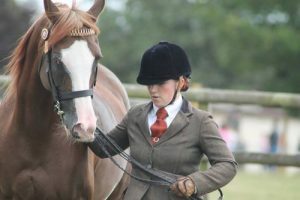 Her first big show of the month was Stoneleigh Horse Show, which runs alongside the British Showjumping National Championships, and is the only show in the season to provide the full range of HOYS qualifiers. It was a show tinged with sadness and longing for me as I originally intended to compete in the Junior Academy Team showjumping Championships with Odin, although I was still very much looking forward to Penny’s showing class. As we waited for the Arabian classes to start, I sat on the lorry ramp and watched as one top class horse after another arrived and warmed up in front of me. We were parked right behind showing legend Robert Walker’s lorry, so I watched with interest as to how he prepared his horses and how kind he was with them, with his grooms, and with everyone that he encountered. I’ve admired him for a long time and, although I couldn’t find the courage to go up and talk to him, just watching him made me feel like I too could be a professional rider who could qualify multiple horses in different classes all in a day’s work. The class itself was extraordinary, and I loved every second of it. Penny went beautifully for both myself and the judge, although we let ourselves down in the conformation section as I didn’t want to mess with her original halt too much; she can get quite annoyed if I correct her. I wasn’t surprised with my placing, third out of four, but it seemed a lot better than it looks on paper. The winner of the class was 2016 HOYS Champion Sharinaah (Kais x Sherruka), who took the golden ticket on this occasion, and second was WLA Alaska (WLA Falcorr x GAS Paloma) who took her HOYS ticket at the AHS National Championships and went reserve to Sharinaah at Stoneleigh. I received some incredibly useful advice and kind words from the ride judge, who really put Penny through her paces and I must have been the happiest competitor with a yellow rosette on the whole showground! Raring to go after Stoneleigh, it was soon time to shine again at the UK International Arab Horse Show (UKIAHS) and the Ridden Arabian Star Series (RASS) Championships, which were held alongside the UK’s only ECAHO A show. Our first class of the weekend was the final HOYS qualifier for 2018; Penny was feeling amazing, I was dizzy with excitement, and we strutted into the ring like we owned it. After an enjoyable, if little keen, go around, Penny gave the judge one of a few really good rides and stood up beautifully for the conformation judge. I was shocked and disappointed to be called in last place, and even more so to find that the ride mark was 15 out of 50. I tried to hide my disappointment; I was thrilled with how she went and that’s all that really mattered, but it hurt my head and my heart when I thought of Penny’s mark and what she did to earn it. After a very long and cold night alone in the lorry – mum was coming to and from the show each day – I had the chance to meet the judge and he was able to talk with us about what led to him giving her such a low mark. Apparently, Penny had given him a ride that would otherwise have scored in the 40s, but she was “thick in the wind”, likely as a reaction to dust or irritation. As a hunter judge, any sign of a breathing problem, even a passing allergy or post-viral symptom, is a serious issue and we were marked accordingly. After being reassured that only prolonged galloping would cause her any harm, the judge urged us to continue with our remaining classes. 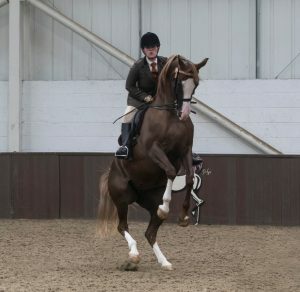 Our next venture into the ring was for the international ridden mare class and Penny, seemingly scorned by standing at the bottom of the line in the previous class, was breathing fire. After a rather well executed levade in the go-around, I elected to withdraw her from further judging which was a real shame as I had really looked forward to the class and the feedback I could have received if she was being a good girl. As ever, I couldn’t be mad at Penny as mum found a very tight spot in her shoulder that was causing her discomfort when cantering. After treatment, I schooled Penny in the outdoor warm up arena and she went perfectly – much to the disappointment of a few curious onlookers who may have been hoping to see more of her bad behaviour! That evening, I was able to wear my glad rags; my Le Beau Cheval navy wool show jacket and a stock, all part of the glitz and glamour of the RASS Championships. 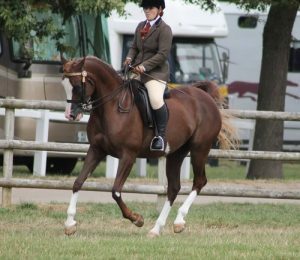 We were up against some fantastic horses, including several who will going to HOYS in October, and I was just excited to show in such company. After a wrong leg in the change of rein in the go around, I was worried that I had already blown it for Penny, but I kept calm and carried on regardless. The set show that the judges had asked for seemed to be catching a lot of experienced combinations out, but Penny handled it beautifully. We completed all of the movements without any mistakes and in fine style, and I was thrilled to be called in the Top Ten of the mares, geldings and stallions. Although only the Gold, Silver and Bronze Champions were awarded, I later found out that Penny and I had finished 5th overall, which was fantastic! We had also won the points categories for Young Rider and Owner Breeder, the prizes of which consisted of a beautiful rosette and a bucket of goodies. Mum also won the Best Dressed Groom in the mare section and we very much enjoyed the alcoholic prize that came with it. Many thanks to the generous sponsors of the prizes; it really gave the championships a special edge and the goody bag for all competitors was much appreciated. The shows were not the only feature of the month and I was kept pleasantly busy by the developments at Avonbrook Stud. After his owner sustained a broken leg, a Marcus-baby joined the team and will stay with us for a couple of months to continue his education while his owner is out of action. PS Ibn Aurelius (Marcus Aurelius x PS Silvern Silk), called ‘Rory’ in the stable, is a purebred five-year old gelding who certainly fits in with his family at the stud, and is a very exciting ridden project for the coming years. Although quite green, he is very willing and eager to please which stands him in good stead for his future performance career. I have also been out to ride a couple of horses for friends to develop the breadth and depth of my experience. 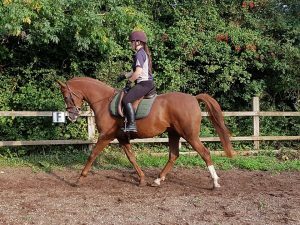 I am having great fun jumping on a friend’s scopey and promising purebred Arab gelding, as well as on an attractive young fell pony with a naturally very impressive jump! I haven’t completely abandoned jumping the horses at home, however. Penny went to her first ever jumping competition and went double clear for a very credible 4th place in a 65cm class, and her sire Marcus Aurelius (Aurelian x Fiesta Magica) stormed round the 85cm, also for 4th place against some very fast ponies. Marcus has had quite a quiet month on the competition front, although we have participated in a couple of hound exercises with the Croome, accompanied by our freelance groom Lisa and ‘Robbie’, Avonbrook Silver Eagle (Marcus Aurelius x Caveland Calypso). We’ve had some real excitement, including almost falling off Marcus in a very deep ford after Robbie ricocheted off us in his haste to get out of the water and being stung by a hornet. Luckily, neither Marcus nor Robbie were stung but it was terrifying to watch one horse and rider get swarmed by the nest and I can only thank the following car who was able to get help before any lasting physical harm was done. Marcus kept calm for us all and led his large herd safely around the field away from the nest to rejoin the hounds and the hunt staff, who were able to go past the nest before it was provoked. For days afterwards, the sting I had sustained on my leg was uncomfortable and it felt like the affected muscle was being dissolved by the venom at times. Just as I was contemplating going to a pharmacy or GP, the swelling localised back to where I was stung and I could walk normally again so I was satisfied to keep treating it at home. Thank you to Lisa for driving me to the meets, and well done Robbie for not showing your dad up; it’s quite a lot to process when in the middle of a dense pack. 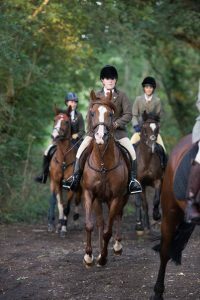 Not that Marcus cared, and his manners and leadership skills did not go unnoticed; we’ve been invited out to hunt with the Croome by the master himself which is an honour and I am very lucky to ride such a fantastic stallion!